I'm not familiar with what software is available and cannot recognize the origin of this diagram. Does anyone know what software this is? I'm only guessing that it can perform simulation; it may just be for layout. It is most likely Fritzing. It is an educational free software quite popular among newbies and teachers. 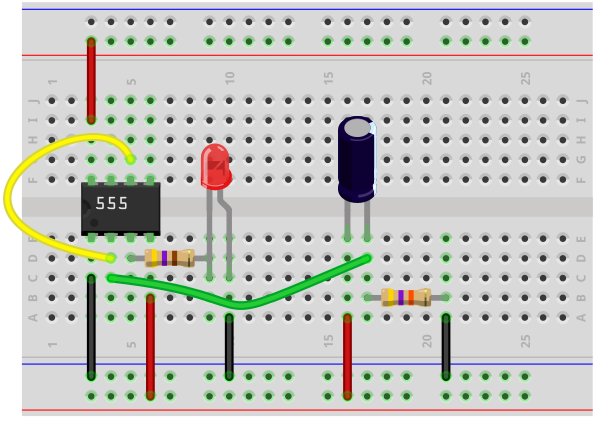 It can draw wiring diagrams like the one you posted, or true schematics and even PCB layouts. It can't simulate the circuit, though. As Felthry and JRE said in comments, using Fritzing is frowned upon on this site and by professional engineers because of the habit of newbies to post wiring diagrams instead of schematics. A wiring diagram is to a schematic what a sketch of the exterior of a building is to its blueprints. It only gives a very partial and incomplete view of the thing you are going to build. So it is usually quite useless for understanding the real working of a circuit. Fritzing in itself it is NOT a bad tool for a newbie, if you understand its purpose. It can be used to draw not too terrible schematics and this won't anger people here. Just avoid asking questions describing your problem using a wiring diagram instead of a true schematic. This will rightfully annoy many engineers and even make some of them mad. It's like a little kid showing his parents a crayon drawing of his electronic toy asking "how do it work this?". The parents are probably going to laugh at his naivety with affection. Of course if a teenager or a grown-up shows a wiring diagram to an EE with the same naivety, maybe "requiring" a coherent answer to his problem, the effect can be drastically different! Note: although seemingly the same thing, posting a photo of a real breadboard with a real circuit built on it (together with its schematic) will sometimes be useful to diagnose problems related to the actual wiring. Not the answer you're looking for? Browse other questions tagged simulation layout breadboard software or ask your own question. What is wrong with this PSpice simulation? What software can I use to simulate I.B.I.S Models? What free software can be used to simulate transmission lines and other RF circuits?